Latest from TVLine.com's Ask Ausiello spoiler column. Do you see that kid in the photo, above? 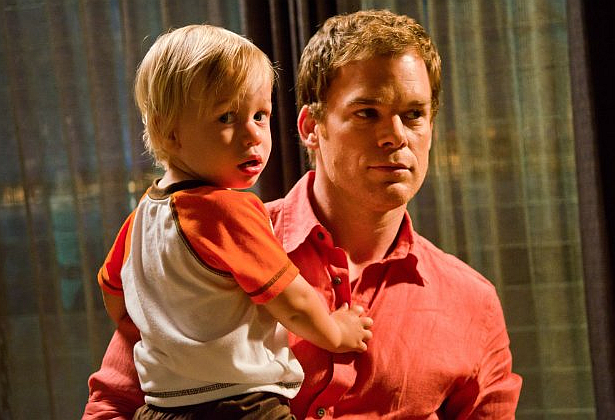 If this scoop is about him, then we're not going to see him again on Dexter! Hit the jump to read a casting spoiler (about Harrison? ), for the eighth season of Dexter. "Producers have quietly begun looking for a 6-year-old boy to play a 4-year-old boy throughout S8, which makes me wonder if Harrison is going to experience a growth spurt between seasons." Does that mean a time-jump? What about the Kruntchev twins Evan and Luke? Sound off in the comments!